During December of 2016, we were tracking a potentially very dangerous formation in the S&P 500, which did not pan out. However, while much of the debate in mainstream financial media was centered around whether or not the Dow Jones Industrial Average would hit 20,000, we were certain that S&P 500 would take out 2285 (which would almost guarantee that Dow would hit 20k), before topping out. 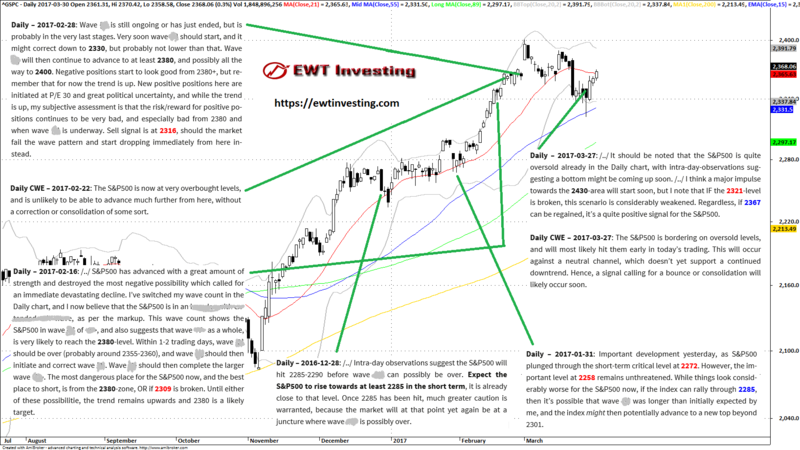 Indeed, S&P 500 hit 2285 a few weeks later, and on the 31st of January 2017, we issued a new analysis update, warning that an important top could possibly be in place. However, the situation was not clear cut, and the S&P 500 did not take out lower and more important sell signal levels during the initial decline, which compelled us to warn of a possible trend continuation upwards, whilst pointing out a potentially very catastrophic scenario if the market would drop just a little more. As it turned out, the S&P 500 rallied strongly into February of 2017. It would be unfair to say that we predicted this rally, because we did not have it as a most favoured scenario at the time of the 2017-01-31 update. The only thing we can claim is that we correctly pointed out 2285 as a trigger level for a trend continuation upwards. Our next major analysis update for the S&P 500 was written on the 16th of February. The strong market advance had killed off a potential very negative Elliott Wave scenario, which we noted. Also, a revision was made to our most favoured Elliott Wave count at the time. In the update, we set up the 2380 level as the best place to short the S&P 500 from. A few days later, on the 22nd of February, the S&P 500 was flagged at extremely overbought levels in our adaptive channel system, and we warned that a consolidation or correction was likely imminent. As it turned out, the S&P 500 settled the overboughtness by conducting a sideways 4th wave. Before the start of trading on the 28th of February, we issued a new update, in which we called for a minor correction, to be followed by an advance to 2380-2400. Again we made the assessment that taking negative positions on the S&P 500 would be best achieved from 2380+. As it turned out, the correction became very shallow and in fact ended that day, with the S&P 500 gapping up the next day, achieving our primary 2380-target and the secondary 2400-target all in the same trading day. That indeed marked the top for that market phase. The next significant update – there were of course updates made in between for our subscribers, but due to the market moves, not unique enough to include in this summary – was made on the 27th of March, when before the start of trading, we noted that the S&P 500 was extremely likely to hit oversold levels early in the day’s trading, and that the end to the corrective decline was most likely close at hand. We also noted 2321 as a critical level (in the cash index), and it was untouched, though, barely. The S&P 500 rallied considerably intra-day and has carried on from there. It now remains to be seen if our call for 2430 to be reached, will actually materialize.